Please | No Parking or Camping is allowed along the road Thursday night prior to the festival. Line up starts at daybreak Friday. Camping is included with an Adult Weekend Wristband. Members in good standing are allowed to reserve a campsite for $50.00. New Handicap Camping Area Reservations are not available at this time. Patrons with existing reservations must call by MARCH 15th, 2019 to re-reserve their handicap site for 2019. 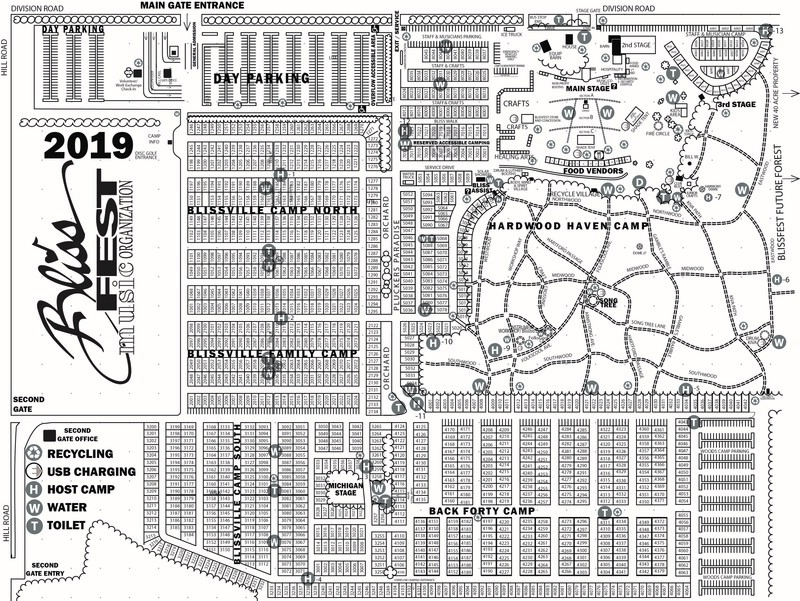 Patrons with an official handicap sticker and have Camping Units 16' or less will have the option to camp in our marked Overflow Handicap Camping Area on a first-come / first served basis - please see main gate attendants for directions. 1. What is included with the price of my wristband? Admission to the festival, camping at the festival, with access to all four stages, as well as other workshop tents. Some of the take home craft workshops require a very small fee, usually $5 for materials. 2. How much do wristbands cost? Prices vary depending on when you buy and if you are a member of the organization. Prices are listed on the Buy Wristbands page. Early-bird prices are available only for a limited time. 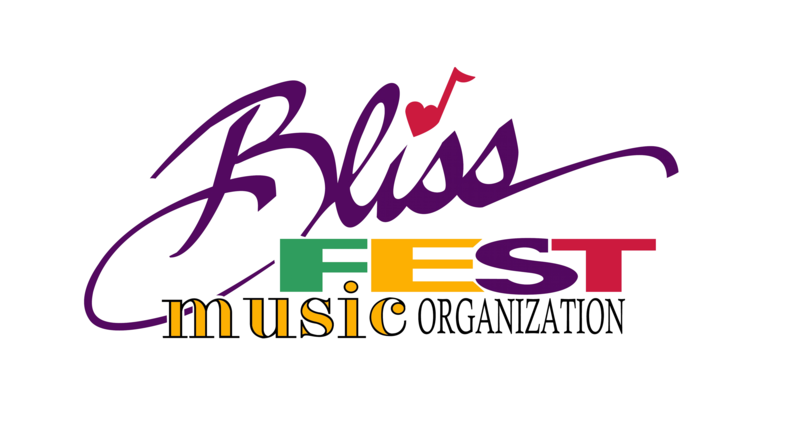 Remember Blissfest members get a discount. 3. Does camping cost extra? No…. Camping is included in the price of a weekend wristband. 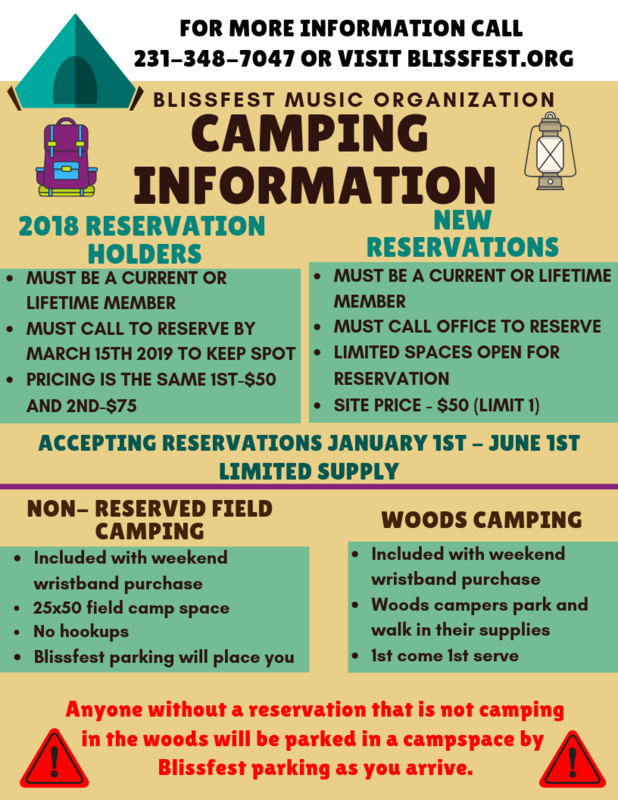 Camping includes parking for the weekend and three nights camping.If you do not have a reserved campsite or are going in the woods you will be placed ina spot by Blissfest Parking as you arrive. No, you will not be able to drive around looking for spots like in previous years. Checkout Monday by noon. See # 5 for reserved campsites. 4. What discounts does a membership get you? 5. Can I reserve a specific campsite? Members only. Yes, you must call the office (231-348-7047) and be a current member with your wristbands already purchased. Limited spaces open for reservation. 6. If I am under 18 and want to come to the festival, what can I do? You can not attend without adult supervision. This means your parent or guardian or adult family member must be in attendance and you need to camp with them. 7. Can I buy a ticket for just one day? Yes, you can, but only for Saturday. You are NOT allowed to camp with a day wristband and must leave festival grounds by 12 midnight on the day of your purchased wristband. 8. Can I camp Saturday night only? You may, but you must have a weekend wristband in order to camp. 9. What time do the gates open? Gates open at 9 a.m. on the Friday of the festival. You may not camp along the road in your car Thurs. night. The lineup starts at daybreak. There are other camping options in the area Thurs. night. See the accommodations page on the web site. Please do not intend to start lining up any earlier than daybreak. 10. Do you allow refunds for wristbands? 16. Are wristbands unlimited or do you only allow so many wristbands to be sold? No, the wristbands are not unlimited and we usually sell out!!!! We have a maximum of 4,500 paid tickets available Friday and Sunday with a max on Saturday of 5,000. This includes daily and weekend tickets. 2. State law for temporary campgrounds requires a minimum of 10′ separating camping units. This is for fire protection. 3. Do not block roads and access points in the campground. 4. No ground fires or charcoal fires of any kind. 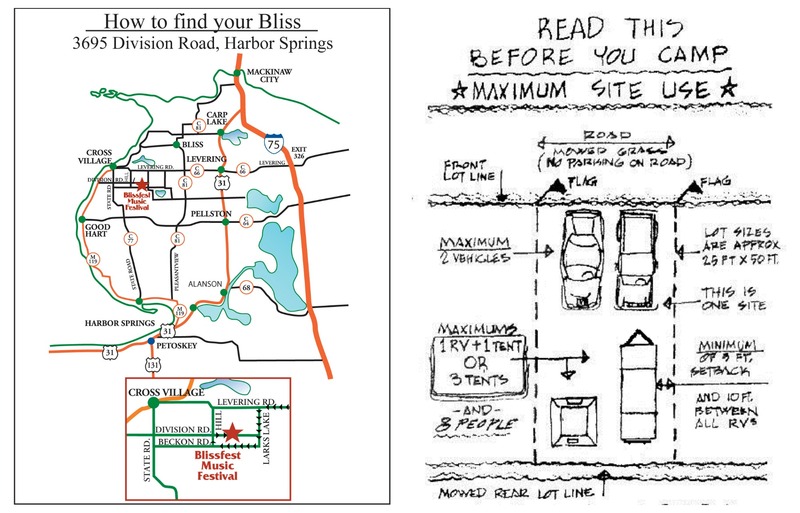 The Blissfest has a Special Use Permit allowing use of the Back 40 Campground Area that we lease from our neighbor. The Special Use Permit is conditional upon meeting performance standards regarding noise levels and appropriate infrastructure. Continued use of this area requires that campers exercise care and responsible behavior. The festival a limited number of sites and parking in this area. The density level will be monitored and controlled. There will again be designated parking in the “Back 40” for those who wish to walk-in camp in the woods. Please camp and park only in designated areas. All camping areas will require a general quiet down period starting at midnight. It is important that all festival participants honor this rule since our collective behavior will determine if we can continue camping at all. Quiet-down simply means that we can sing, play music and have fun but we can not disturb fellow campers or the local neighbors.